The Carroll A. Deering was built in Maine in 1919 as a cargo ship. 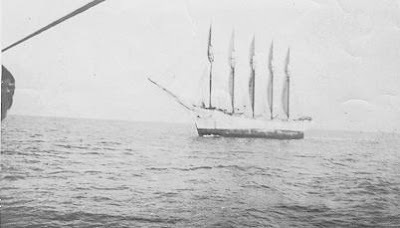 It was a five-masted commercial schooner set to go to Rio De Janeiro when it mysteriously wound up aground on Cape Hatteras, North Carolina in 1921. On August 19, 1920, the ship was ready to set sail from Norfolk, Virginia to Rio De Janeiro with a cargo of coal. On August 22nd, the Deering left Newport News with William H. Merritt as captain and his son, Sewall, as first mate. Merritt soon fell ill and he and his son were left at Lewes, Delaware and Captain W. B. Wormell was hired to replace Merritt. Charles B. McLellan was hired as first mate and the ship once again set sail for Rio on September 8, 1920, arrived and delivered it's cargo without incident. Captain Wormell apparently complained to another captain in the area about his crew, save for one--the engineer, Herbert Bates. The Deering left Rio on December 2nd and stopped for supplies in Barbados where First Mate McLellan got drunk and complained about Captain Wormell--specifically having to do all the navigation due to the aging captain's eyesight. He even openly threatened the captain to himself and was arrested. On January 9, 1921, Captain Wormell forgave McLellan and bailed him out of jail and set sail again. The ship was next sighted by the Cape Lookout Lightship in North Carolina on January 28, 1921, when the vessel hailed the lightship. The lightship's keeper, Captain Jacobson, reported that a thin man with reddish hair and a foreign accent told him the vessel had lost its anchors. He noticed that the crew seemed to be "milling around" on the fore deck of the ship, an area where they were usually not allowed. On January 31, 1921, the Deering was sighted run aground on Diamond Shoals, an area off the coast of Cape Hatteras, North Carolina, that has long been notorious for its reputation as a common site of shipwrecks. The ship was not boarded until February 4, and it became clear that the ship had been completely abandoned. The ship's log and navigation equipment were gone, as were the crew's personal effects and the ship's two lifeboats. DEERING CAPTURED BY OIL BURNING BOAT SOMETHING LIKE CHASER. TAKING OFF EVERYTHING HANDCUFFING CREW. CREW HIDING ALL OVER SHIP NO CHANCE TO MAKE ESCAPE. FINDER PLEASE NOTIFY HEADQUARTERS DEERING. The handwriting in the letter was matched to that of the ship's engineer Bates by the widow of Captain Wormell, and the bottle was proven to have been manufactured in Brazil. Yet this caused some controversy—if a crew member did manage to get hold of paper, pen, and bottle and write a letter, why would he request that the company be notified, as opposed to the police or Coast Guard? Piracy: It was believed that a group of pirates were responsible for the disappearances; however, no real evidence of this theory emerged. Communist Piracy: During an FBI raid, agents found papers that supposedly called on members of the organization to seize American ships and sail them to Russia. Though it is an intriguing suggestion, no definitive proof that any of these activities were actually carried out has surfaced. Rum Runners: A similar theory to the above speculates that a group of liquor smugglers working out of the Bahamas stole the ship to use as a rum-running vessel. This theory is believable and certainly plausible, but as with the above, no definitive proof has ever been found. Mutiny: Wormell's known conflict with his first mate and derisive comments towards his crew while in Rio De Janeiro suggested that something may have been amiss between the captain and his men on the voyage. Captain Jacobson at Cape Lookout certainly thought it odd; the man who hailed his vessel was definitely not Captain Wormell, and he was not an officer by all accounts. Discontent with the captain could certainly have caused a mutiny of the crew, but once again, nothing definitive has ever been proven. It has also been suggested that since this ship sailed through the area known as the Bermuda Triangle, that explains the crew's disappearance. The investigation remained largely fruitless, but it did take an interesting turn when Christopher Columbus Gray admitted the letter he had recovered had been forged. When an Italian inquiry into the disappearance of the vessel Monte San Michele revealed that there indeed had been heavy hurricanes in the vicinity, most of the conspiracy theories were dropped and mutiny was generally accepted as the answer to the riddle. The investigation finally wound down in late 1922 without an official ruling on the fate of the Deering. No explanation for the disappearance of the crew of the Carroll A. Deering was ever officially verified, though all of the genuine evidence seems to point to mutiny. Suggest a story for "The Stull Chronicles". Just send a suggestion and I'll look it up and research it.